Does Marijuana Cause Global Warming? ♫ Well my dog died just yesterday and left me all alone. The finance company dropped by today and repossessed my home. And I’m down to seeds and stems again, too. Commander Cody’s lament, poignantly twanged by Telemaster Bill Kirchen, harks back to a bygone era, before medical marijuana and the electrification of indoor victory gardens. Things are different now. Tea leaves are harvested in abundance. Indoor marijuana cultivation consumes enough electricity to power 2 million average-sized U.S. homes, which corresponds to about 1 percent of national power consumption, according to a study by a staff scientist at the Lawrence Berkeley National Laboratory. 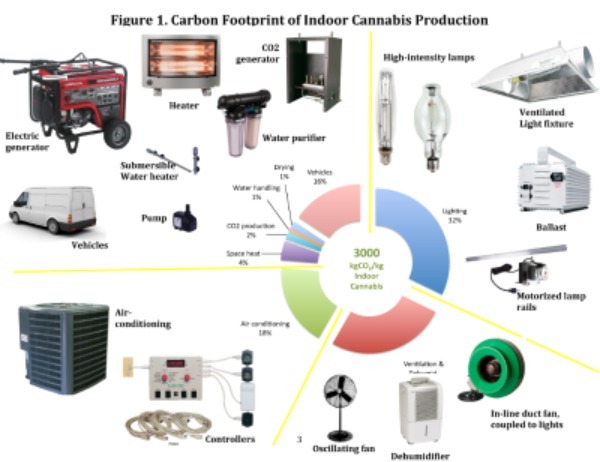 Researcher Evan Mills’ study notes that cannabis production has largely shifted indoors, especially in California, where medical marijuana growers use high-intensity lights usually reserved for operating rooms that are 500 times more powerful that a standard reading lamp. The resulting price tag is about $5 billion in annual electricity costs, said Mills, who conducted and published the research independently from the Berkeley lab. The resulting contribution to greenhouse gas emissions equals about 3 million cars on the road, he said. Narrowing the implications even further reveals some staggering numbers. Mills said a single marijuana cigarette represents 2 pounds of CO2 emissions, an amount equal to running a 100-watt light bulb for 17 hours. 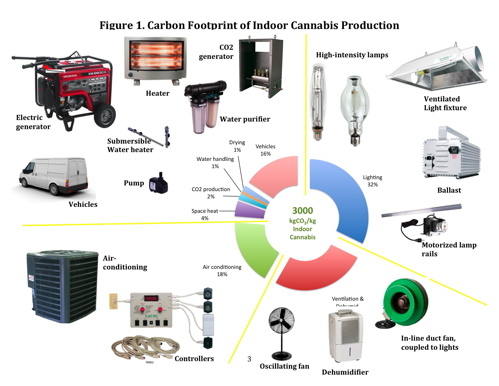 Mills went on to compare an average pot-growing facility to the electric power intensity of a data center. In California, which is the top producing state and one of 17 states to allow medical use of marijuana, cultivation accounts for 3 percent of all electricity use and 8 percent of household use, he said. 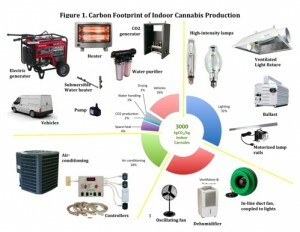 Mills added that he completed his research with no external sponsorship, insisting that he does not mean to pass judgment on the merits of cannabis cultivation or use. He also suggested that the minimal amount of information available and the almost complete lack of regulation of the industry mean energy consumption could easily be lowered. Mills, a member of the U.N. Intergovernmental Panel on Climate Change, drew his data from open literature and interviews with horticultural equipment retailers. By some estimates, marijuana has long been the largest cash crop in the United States — ahead of corn, soybeans and hay. The industry has been pegged at about $40 billion in value, with California, Tennessee, Kentucky, Hawaii and Washington the top five production states. 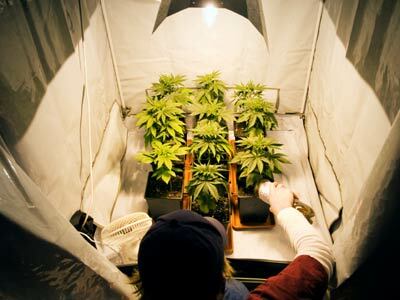 Water consumption is also an issue when it comes to environmental impact, with each marijuana plant said to need between 3 and 5 gallons of water per day to grow to fruition. Click here to read Mills’ study. Sullivan is based in San Francisco. Then legalize it. At least 1/3 of the pharma corps will go bankrupt or shrink. i was going to quit smokin weed but i always forget to.